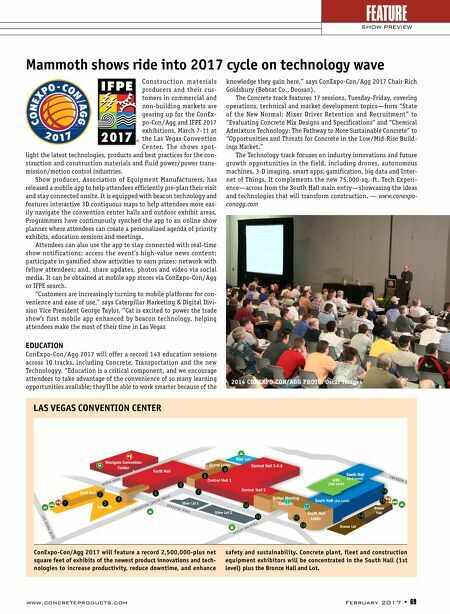 www.concreteproducts.com February 2017 • 69 Construction materials producers and their cus- tomers in commercial and non-building markets are gearing up for the ConEx- po-Con/Agg and IFPE 2017 exhibitions, March 7-11 at the Las Vegas Convention Center. The shows spot- light the latest technologies, products and best practices for the con- struction and construction materials and fluid power/power trans- mission/motion control industries. Show producer, Association of Equipment Manufacturers, has released a mobile app to help attendees efficiently pre-plan their visit and stay connected onsite. It is equipped with beacon technology and features interactive 3D contiguous maps to help attendees more eas- ily navigate the convention center halls and outdoor exhibit areas. Programmers have continuously synched the app to an online show planner where attendees can create a personalized agenda of priority exhibits, education sessions and meetings. Attendees can also use the app to stay connected with real-time show notifications; access the event's high-value news content; participate in gamified show activities to earn prizes; network with fellow attendees; and, share updates, photos and video via social media. It can be obtained at mobile app stores via ConExpo-Con/Agg or IFPE search. "Customers are increasingly turning to mobile platforms for con- venience and ease of use," says Caterpillar Marketing & Digital Divi- sion Vice President George Taylor. 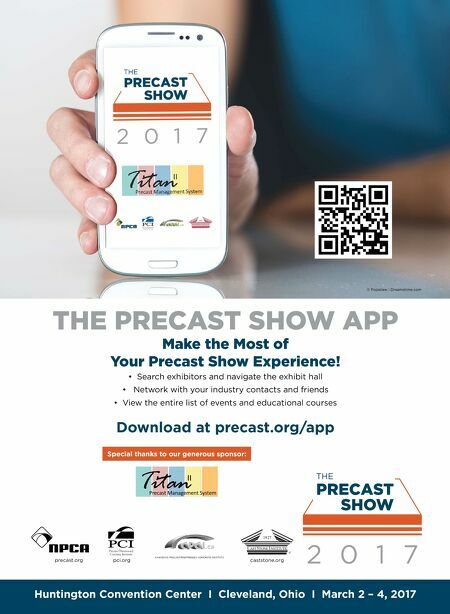 "Cat is excited to power the trade show's first mobile app enhanced by beacon technology, helping attendees make the most of their time in Las Vegas EDUCATION ConExpo-Con/Agg 2017 will offer a record 143 education sessions across 10 tracks, including Concrete, Transportation and the new Technologyy. "Education is a critical component, and we encourage attendees to take advantage of the convenience of so many learning opportunities available; they'll be able to work smarter because of the knowledge they gain here," says ConExpo-Con/Agg 2017 Chair Rich Goldsbury (Bobcat Co., Doosan). The Concrete track features 17 sessions, Tuesday-Friday, covering operations, technical and market development topics—from "State of the New Normal: Mixer Driver Retention and Recruitment" to "Evaluating Concrete Mix Designs and Specifications" and "Chemical Admixture Technology: The Pathway to More Sustainable Concrete" to "Opportunities and Threats for Concrete in the Low/Mid-Rise Build- ings Market." The Technology track focuses on industry innovations and future growth opportunities in the field, including drones, autonomous machines, 3-D imaging, smart apps, gamification, big data and Inter- net of Things. It complements the new 75,000-sq.-ft. Tech Experi- ence—across from the South Hall main entry—showcasing the ideas and technologies that will transform construction. — www.conexpo- conagg.com FEATURE SHOW PREVIEW Mammoth shows ride into 2017 cycle on technology wave 2014 CONEXPO-CON/AGG PHOTO: Oscar Images LAS VEGAS CONVENTION CENTER ConExpo-Con/Agg 2017 will feature a record 2,500,000-plus net square feet of exhibits of the newest product innovations and tech- nologies to increase productivity, reduce downtime, and enhance safety and sustainability. Concrete plant, fleet and construction equipment exhibitors will be concentrated in the South Hall (1st level) plus the Bronze Hall and Lot.